In June of 2011, the New Criterion published Joseph Epstein’s “Heavy Sentences,” ostensibly a review of Professor Stanley Fish’s How to Write a Sentence (and How to Read One). I write “ostensibly” because Mr. Epstein, finding nothing praiseworthy in the professor’s ludicrous little book, made his review the occasion for some general remarks about prose style. I recall finding most of Mr. Epstein’s observations sensible. (How anyone could disagree, for example, with his assertion that, if one wishes to write well, one must read slowly, I cannot see.) But the most intriguing part of Mr. Epstein’s article was his claim that F.L. Lucas’s Style, then unknown to me, is the best book ever written about prose composition. After finishing “Heavy Sentences,” I searched Amazon.com for a copy: the cheapest one I was able to locate, in “Acceptable” condition, cost $250, a price tag sufficient to discourage me. Yet a few weeks later I began to make a habit of visiting Amazon (and Amazon UK and eBay and AbeBooks and Alibris) hoping to find Style at a modest price. 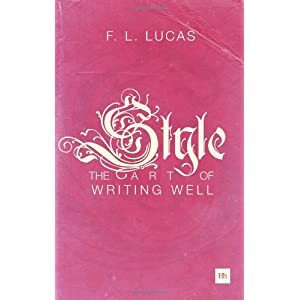 The harder Professor Lucas’s book proved to obtain, the more convinced I became that the pages of Style contained some kind of anagogic prose “system,” which, once I became initiated into it, would allow me to write perfectly. I am not, it turns out, the only person who searched the Internet for a copy of Style after reading Mr. Epstein’s article. Christopher Parker, an editor at U.K. publishing firm Harriman House, read “Heavy Sentences” and, discovering how rare Lucas’s book has become (it has been out of print since 1974), decided to ask Dr. S. Oliver Lucas, the late professor’s son, for permission to reissue his father’s book. Harriman’s new printing, a handsome trade paperback, follows the text of Lucas’s second edition. From Lucas’s preface one learns that he made only one major change to his book for the second edition (and this he did only in response to letters from readers): for his many quotations from Greek, Latin, German, and French, he decided to provide translations—his own. Before reading the biographical sketch that Alexander Zambellas of the Bodelain Library has kindly provided for this new edition of Style, I admit that I knew very little about F.L. Lucas. Born in 1894, Lucas was a Fellow of King’s College, Cambridge, who served Britain in both World Wars, wrote a great deal of poetry (some of which has been widely anthologized), and produced a complete edition of John Webster that received praise from T.S. Eliot. Once divorced, once widowed, three times married, Lucas moved among the Bloomsbury élite as a young man but devoted the last three decades of his life to his family, dying in 1967. Unlike The Elements of Style, Professor Lucas’s book does not double as a guide to usage. (Instead Lucas advises readers with usage questions to consult H.W. Fowler’s Modern English Usage, which he calls “admirable” and “never more needed.”) Nor is it organized as a series of bullet points or encyclopedia entries. Style began as a Cambridge lecture series, and in its eleven chapters something of the slightly informal tone of the lecture hall remains. If, like me, you are accustomed to nescient academics yowling from the page like Holofernes, you will welcome Lucas’s lightly-borne erudition. I can think of only one instance in which this approach fails him. In his chapter on metaphor, Lucas writes: “As for the humour that imagery can give, I do not know who illustrates this better than dear Fuller.” The “dear Fuller” in question is Thomas Fuller, the historian, biographer, and chaplain to Charles II—not a writer whom most of us can hope to identify by surname alone. Lucas should have introduced this obscure author more carefully. Lucas wastes no time fulminating à la Orwell against the passive voice, and he uses semi-colons the only way a serious writer ought to: however he pleases. He is probably the only style guide author whose precepts would not lead one to rewrite the first sentence of Pride and Prejudice as “Everyone believes that rich men want to get married.” As for his verbal soteriology, he seems to believe that there is a chance of salvation for those not in full communion with the Church of the Active Verb. What has changed since Lucas’s day? Here are two sentences I found in a book I pulled at random from the Henry James collection at an academic library: “In the popular techno-romances of prior decades, the course of ‘wired love,’ no matter how circuitous, was never so perverse and devious. But James also mediates our imagined access to this brazen, and at the same time clandestine, communication.” Typical, one thinks, of critics in this or any age: Lucas agrees. Lucas admiringly quotes Anatole France’s recipe for good style (“First, clarity; then again clarity; and, finally, clarity”), but it is not one that he endorses. Character, according to Lucas, is the true “foundation of style.” Why did Lancelot Andrewes, Dr. Johnson, and Jane Austen write better prose than, say, John Donne, Jonathan Swift, and George Meredith—consistently? Simply put, to their rivals and contemporaries, they were morally superior. Here I think Lucas is correct. Certainly Lucas’s style—vigorous, free of cant, occasionally playful but never frivolous—seems to owe a great deal to his own admirable character. At Cambridge in the 1930s, Lucas found himself on the qui vive as the university “grew full of very green young men going very Red.” Later he proved himself one of England’s most spirited opponents of appeasement, writing over forty letters denouncing the policy of the Chamberlain government; these unfortunately remain uncollected. Alexander Zamebellas informs us that the Nazis listed Lucas among those whom, after defeating Britain, they were to execute immediately. Lucas’s record in the Second World War is more distinguished than those of many famous writers: Sgt. Anthony Burgess (briefly) deserted and taught languages at Gibraltar; Evelyn Waugh, commando, broke his fibula and wrote two novels; F.L. Lucas worked nine hour shifts for Britain’s Foreign Office at Bletchley Park, where precise, compact prose saved lives. Many writers who possess one literary virtue lack another. Nabokov wrote with rare clarity, but his work tends to be spoiled by a verbal flatulence that fouls the otherwise redolent atmosphere of his prose. Sir Thomas Browne was longwinded, recondite, fallacious; yet he was also exuberant and above all original, so he continues to amuse his small readership. For Lucas, Chateaubriand and Flaubert, two very different French writers, exemplify everything necessary for good style (save perhaps gaiety). He devotes five pages to a catalogue of their images, and several more to discussing the Hermit of Croisset’s legendary slowness as a writer. Which brings me to one of the most pleasurable aspects of reading Style: that is, learning Lucas’s opinions of one’s writing related crotchets and caprices. Those like me who smoke while writing will be glad to learn that the professor does not disapprove of their habit. Lucas recommends writing allegro and revising adagio, where Flaubert, “the martyr of style,” wrote grave and revised larghissimo. The fact that so much of Style is brilliant serves, I think, to magnify the book’s few flaws. For one thing, it is too long to be used effectively in today’s undergraduate classrooms; that this points more to the impoverished state of undergraduate studies rather to any shortcoming on the part of Professor Lucas does not make it less true. Also, Lucas’s thirty-five page chapter on prosody is surely superfluous; moreover, it is frequently boring. The professor’s taste is idiosyncratic, though only once, when he asserts that Dr. Johnson’s Rasselas is inferior to Voltaire’s Candide, does his judgement appear to me definitely in error. Too many of Lucas’s examples are culled from poetry: the breakneck succession of metaphors he quotes from Troilus and Cressida is exhilarating as verse but would make for tedious prose. Still, Style contains neither a single awkwardly constructed sentence nor even one poorly organized paragraph: of how many non-fiction books written in the last half century could one say the same? Matthew Walther is an American writer. To help New English Review continue to publish interesting and timely articles such as this one, please click here. If you enjoyed this article and want to read more by Matthew Walther, please click here.